Thank you, 20+ years in the Army. Spent 11 years of that in the great state of Texas and my oldest was born in San Antonio, who is a HUGE Texans fan. Many deployments and am blessed to have experienced both the greatness and tragedies of mankind. Serving has been my utmost honor. The Texans are easily my #2 and I follow them closely because of my son. We are already set to make the trip back down there again next season when the Bengals are slotted to visit the Texans. In regards to the topic, I've just always been a fan of McCarron and now am happy that he is again on a team I root for !!! I was hoping my Bengals would have brought him back for more. House of Pain, Texansballer74, maverick512000 and 8 others like this. With new guru working with #4 Mccarron should get some good coaching. I'm looking forward to huge leads where AJ closes some games. It's about situation for many players. Team just got younger. CWTexansFan, Texan Asylum and OptimisticTexan like this. Thanks for your service. Refreshing to see an outside fan so respectful and down to earth. Glad to get AJ and Webb. Not much else to be excited about thus far in free agency for the Texans. Texan Asylum and OptimisticTexan like this. I may be wrong but I believe the two d-backs we signed are also younger than the ones they replaced. CWTexansFan, steelbtexan, JamTex and 1 other person like this. Yes as will be draft picks. There are some positives going on. Maybe with some better players we will see better coaching? maverick512000, CWTexansFan, OptimisticTexan and 1 other person like this. Joseph will have to replaced by somebody younger very soon. I agree but that's been said in more than one off season. We can get at least 2 corners in first four picks and couple more as UDFAs. I'm more concerned about Nicole and Roby than Joseph. And thanks to you too as well. You guys and gals stand the line daily and don’t get near the thanks and respect you deserve...Lord bless and keep you sir. Right. And don't forget all the 1 year contracts. Same boat again next year. Desperate for DBs. With the addition of QB A.J. McCarron, the #Texans are now the only team in the NFL with multiple National Championship-winning QBs on their roster. McCarron led @AlabamaFTBL to titles in 2011 and 2012, while @DeshaunWatson led @ClemsonFB to a championship in 2016. OptimisticTexan and Texan Asylum like this. I'm happy with this move. He's about everything you could ask for in a backup QB. Has experience, doesn't have the worst stats, is fairly young, has played in the "big game" and won yeah it was college but still and he has a smoking hot wife. Hell this time 3-4 years ago we would have been happy if he was named the starter. He's not there to captain the ship just to keep it floating if the captain goes down. CWTexansFan, steelbtexan, Texan Asylum and 3 others like this. I am feeling very good about the signing. It looks like we have finally got a backup QB that can come off the bench and give us a chance to keep the season alive if Watson gets injured. CWTexansFan, steelbtexan, Texan Asylum and 1 other person like this. He led 'Bama to 2 national championships but how much of that was due to good teammates? I'm not too familiar with him. Does he have a strong arm? Can he run? Anybody think he could take the starting job away from Watson? Judged to be mostly team hence his 5th round selection. Decent arm. Can move behind the line, not run threat. Not a snowball's chance at taking the starting job. Texas Jake, CWTexansFan, steelbtexan and 1 other person like this. Thats great buuuut it's the pros. So now we have A.J. McCarron. Can he block on the offensive line? No, but I sure as hell like the prospects of him being a stable QB2 if Watson is injured. CWTexansFan, Texas Jake and steelbtexan like this. Thanks for your service and congrats on a great career in the military while serving your country. Also an Army vet here - AIRBORNE ! Just for a couple years though. Good to see the Texans have a few fans outside of the city and even outside the state. I have a nephew in Austin and brother in Springfield, Mo who also pull for the Texans but second to the the KC Chiefs. powda and OptimisticTexan like this. 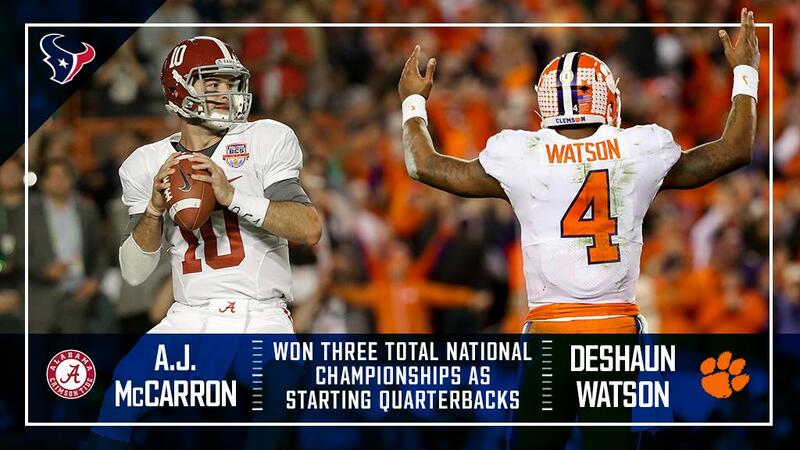 Watson is a smart guy. But I seriously think he had issues calling protection. I suspect as much because of the free rushers unaccounted for. Don't get me wrong. I saw McCarron as the best QB in that draft. But never saw him as anything other than a placeholder. Remember I didn't want to spend 1-1 or even 2-1 on a QB in that draft. 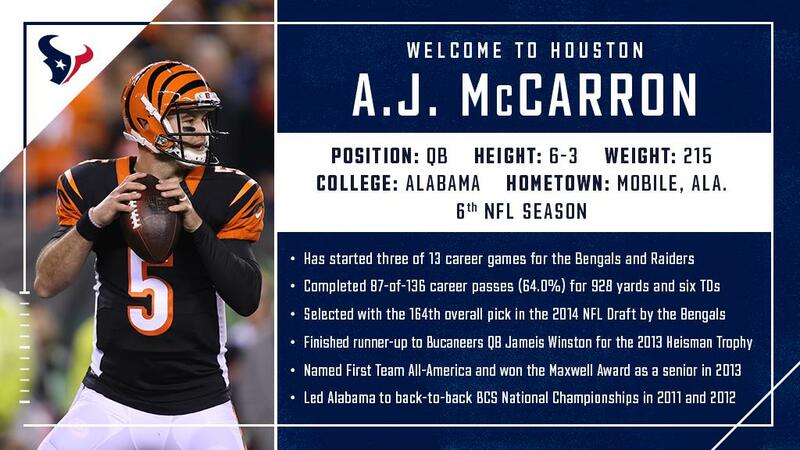 Still, I can't help but think McCarron fits BO'bs ideal (Hoyer, Savage) QB prospect. While I am glad we have AMac on the roster I am suspicious of BO'bs motive. CWTexansFan, OptimisticTexan and Earl34 like this.